Atlanta set a new record for visitation in a single year, welcoming 45 million visitors in 2013. 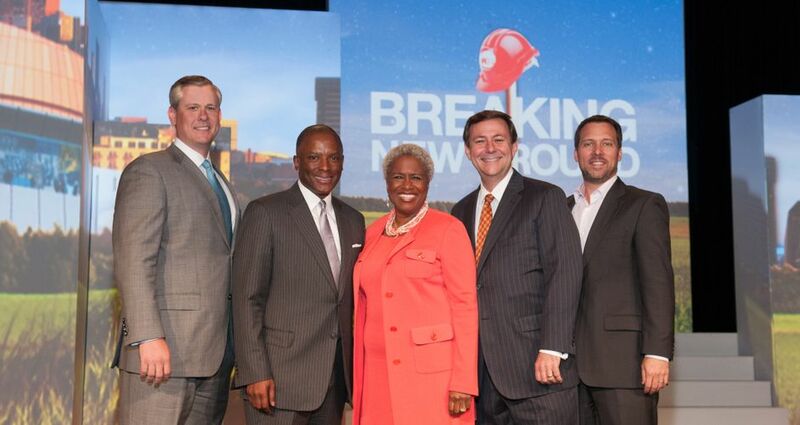 Atlanta Mayor Kasim Reed and Atlanta Convention & Visitors Bureau (ACVB) President and CEO William Pate announced the milestone at ACVB’s 101st Annual Meeting last Thursday. Visitation to Atlanta increased seven percent over 2012, when Atlanta surpassed 40 million visitors for the first time. The increase has further solidified metro Atlanta’s position as one of the nation’s top travel destinations. ACVB’s annual meeting highlighted the tourism milestone and showcased more than $1.5 billion in new attractions, hotels, retail, and transit coming to Atlanta this year with the theme “Breaking New Ground.” New openings in 2014 include the Center for Civil and Human Rights, College Football Hall of Fame and a new Atlanta Streetcar. Atlanta’s hospitality industry looks to continue this growth by opening another nearly $2 billion in development over the next three years. By 2017, the Atlanta Braves and Atlanta Falcons will both open brand new state-of-the-art stadiums. The same year, Atlanta will become home to a new Major League Soccer team. “Atlanta has a lot of momentum as a destination, which is why I believe we will hit 55 million visitors by the end of the decade.” said William Pate, president and CEO, ACVB.